ROCKLEIGH, N.J. -- Bodil Eriksson has been leading the rebirth of Volvo Car USA from the marketing side, making the Swedish brand's advertising more cohesive and consistent. Eriksson, 52, was appointed executive vice president of the U.S. sales arm in late 2013. 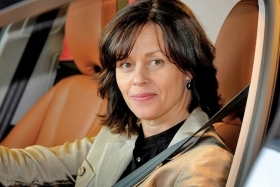 She had been senior vice president of corporate communications for the Volvo Car Group in Gothenburg, Sweden. Since Eriksson's arrival, Volvo has launched the new-generation XC90 crossover and doubled its marketing spending from 2013 levels, she told Automotive News. Eriksson wouldn't disclose Volvo's marketing spending, but according to Kantar Media, Volvo spent $77 million last year compared with $57 million in 2014. Eriksson spoke with Staff Reporter Diana T. Kurylko at Volvo's U.S. headquarters here. Q: How has Volvo changed its message in the United States? A: Every head of marketing starts a new history and me coming on board in 2013 coincided with the transformation of Volvo Car USA. We came from a couple years of low marketing spend. From 2007 on we had seen marketing spend really eroding. Also the messaging, it was linked to a few car launches. It was a situation where the U.S. was not really part of telling and sharing the story of what happened to Volvo cars. In 2013, we started the real transformation of Volvo Car USA and in 2014 product, corporate communications and marketing started working together. That was very interesting for us. There is so much competence, and once you combine them, you can understand how you can leverage coming back. We realized Volvo was out of sight and out of mind and we were not relevant for luxury consumers. Why had this happened? This was already a few years after the company was sold to Geely in 2010 by Ford Motor Co. Lack of communication and lack of visibility and an inability to keep up with competition in terms of marketing. We were not damaged as a brand but we just disappeared. How did you decide what direction to take Volvo marketing? Lots of research, and when we started to gain back awareness the feedback was "Where have you been?" and people embracing us and wanting us to come back. When we started, we also gave communications a big role. We were lagging behind in sharing what was going on within Volvo and what was happening with the $11 billion investment program. That has been an important part of the comeback. We have managed to create an interest with what was happening with the brand and to look at the new technologies and the new design and the new everything. And the actual marketing and advertising? Aligning messaging was a big task. We were all over the place. We were working with one new campaign at a time and often we were dark because we didn't have money to be in the market consistently, and then we came back with a totally new management. We started to align the messaging toward the new XC90. As we started to prelaunch the XC90, we knew where we were going. We focused on our technologies, safety, Drive-E and connectivity -- all of that is consistent throughout all of our cars. The other part was we are a niche brand. We drastically reduced the target group. We had cast too broad a net. We were targeting more than 100 million of the U.S. population via all the media buys. Now we are down to 40 million and even within that group we are supertargeting down to specific individuals by addressable TV and all the data we are building our marketing around. What are the basics of Volvo's brand strategy? We started from that blank sheet with a brand strategy. We have three pillars within the brand strategy, our customer promises: 1. We understand you. 2. We protect what's important for you. 3. We make you feel special. Every one of those has a direct link to cars -- features and benefits. Our cars are developed on the brand strategy. Please give examples of advertising and TV commercials that reflect these brand pillars. The biggest shift came with XC90. We called that campaign "Our Idea of Luxury." It is an umbrella campaign. That is the introduction of the new Volvo. The greatest proof point of the new Volvo is our cars. That is why the launch campaign of the XC90 is around the car. It is a car that takes the technology in a new way, truly made so it should be easy for you as a driver or a passenger to use, to benefit or to be supported by. The way we chose to develop the creative, it is haloing and showcasing the car to make the message trustworthy and credible. The car is stronger than anything else. Media strategywise, we used a different go-to-market strategy than before. You always have TV when you have big launches. Thanks to this strategy of targeting, not only did we focus on targeting the right people but very much on our strong areas. We heavied up in New York, Miami, Los Angeles, the "smile" belt [which runs from the West Coast through parts of the South and up the East Coast] where Volvo has been strong in the past and where we see the SUV segment growing. Half of our last year's media spend was the XC90. Of that there were a lot of national elements because digital buy is half of our media total. Talk about the new interactive ads developed with Volvo's agencies Mindshare and Grey. What were the results? Will you do it again? Those were cinema ads. You sit in the audience and by waving you can choose different configurations and create the more preferred model in the cinema before a movie. It was gesture controlled technology. What we learned and what we wanted to test is not that we have just TV but we are creating a universe on XC90. We took over luxury malls, the Garden State Plaza [in Paramus, N.J.] and in Santa Monica [California]. We did wraps and visuals on buildings and had cars there. We had a mall integration and showed details, the little blue flag on the seat, the shifter and Thor's hammer -- all the things that differentiate the XC90. It was inside and outside the mall. We did that for a couple months and it was very successful. Where does your digital marketing appear? Social media? Google? Your own sites? Everywhere. Our own websites, retailer websites, media buys, the tools on our websites. We have a lot of catch-up to do. We are doing some good things. We have a strong fundamental base with the search component and are working with adaptive marketing. We don't just look at should we advertise on Edmunds or on The New York Times. We follow consumers online and their behavior and serve up an ad based on where you were previously online. Who will Volvo's customers be for the new large S90 sedan? All of them will be conquests. It is predominantly a male segment -- 80 percent. This is a big segment and while there are a lot of traditional preferences -- brands and what you expect from a large sedan -- there are buyers who are looking for new technology and interesting new design and those are the ones we are targeting. The big luxury brands have big buyer groups, but not all of them are core loyalists. There are many that jump between brands. How much is Volvo spending on marketing? How much has the budget increased? In 2014, we said we would double from 2013. We have and we are continuing to grow. From last year, we have shared with our dealers the exact dollar amount that we were investing in advertising -- we hadn't done that before. All of our retailers know how much we spend; we have increased transparency.